This entry was posted in Pic of the Week by Benjamin. Bookmark the permalink. Just a little info: This BMW was produced from 1956-1959. It was made to compete with the Mercedes 300SL but also aimed to be a little below it’s price range so as to be in the middle of the 300SL and the much cheap Austin Healey cars. It had aluminum alloy V8 with pushrod OHV and two Solex Zenith two-barrel carburetors that pushed out a standard 150hp or and optional 160hp. It got from naught to 60 in around 10 seconds and could push to about 125mph top speed. It is thought to be one of the most beautiful cars ever made. 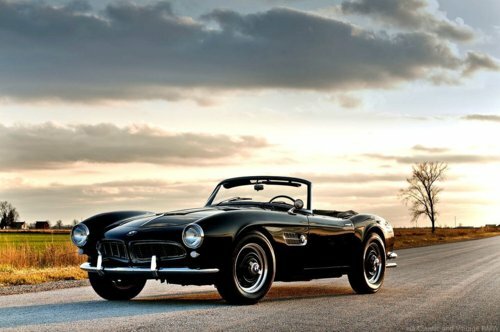 Sadly it almost pushed BMW to bankruptcy and so only 252 of these masterpieces were ever created.